ab32077 detects Epidermal growth factor receptor (EGFR). It does not cross react with other ERBB family members. This product yielded a strong signal in western blot using A431 (human squamous carcinoma) lysate which naturally overexpresses the EGFR protein. Western blot conditions may need to be optimised for cell lines and tissues that express lower levels of endogenous EGFR. Synthetic peptide within Human EGFR aa 1150 to the C-terminus (C terminal). The exact sequence is proprietary. WB: A431 cell lysate. ICC/IF: A431 cells. Flow Cyt: A431 cells. 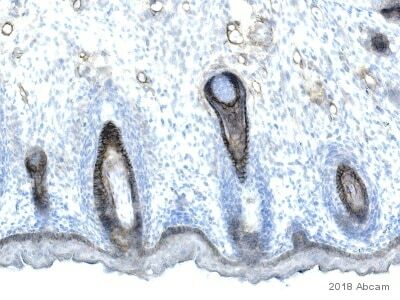 IHC-P: FFPE mouse skin normal. Our Abpromise guarantee covers the use of ab32077 in the following tested applications. IHC-P 1/100 - 1/200. Perform heat mediated antigen retrieval with citrate buffer pH 6 before commencing with IHC staining protocol. WB 1/1000 - 1/10000. Detects a band of approximately 180 kDa (predicted molecular weight: 134 kDa). This blot was produced using a 4-12% Bis-tris gel under the MOPS buffer system. The gel was run at 200V for 50 minutes before being transferred onto a Nitrocellulose membrane at 30V for 70 minutes. The membrane was then blocked for an hour before being incubated with ab32077 overnight at 4°C in the presence of loading control ab18058 (Mouse monoclonal [SPM227] to Vinculin diluted 1:10000). Antibody binding was detected using IR-labelled goat anti-Rabbit Ab at a 1:10,000 dilution for one hour at room temperature before imaging. 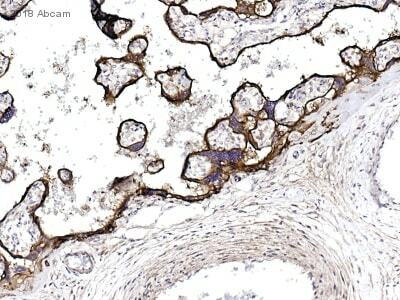 IHC image of EGFR staining in a formalin fixed, paraffin embedded mouse normal skin tissue section, performed on a Leica Bond™ system using the standard protocol B. The section was pre-treated using heat mediated antigen retrieval with sodium citrate buffer (pH6, epitope retrieval solution 1) for 20 mins. The section was then incubated with ab32077 at 1/200 dilution for 15 mins at room temperature. A goat anti-rabbit biotinylated secondary antibody was used to detect the primary, and visualized using an HRP conjugated ABC system. DAB was used as the chromogen. The section was then counterstained with haematoxylin and mounted with DPX. Immunocytochemistry/Immunofluorescence analysis of A431 cells labelling EGFR with ab32077 at 1/500. Cells were fixed with 100% methanol. ab150077, an Alexa Fluor® 488-conjugated goat anti-rabbit IgG (1/1000) was used as the secondary antibody. Overlay histogram showing A431 cells stained with ab32077 (red line). The cells were fixed with 80% methanol (5 min) and then permeabilized with 0.1% PBS-Tween for 20 min. The cells were then incubated in 1x PBS / 10% normal goat serum / 0.3M glycine to block non-specific protein-protein interactions followed by the antibody (ab32077, 1/1000 dilution) for 30 min at 22°C. The secondary antibody used was DyLight® 488 goat anti-rabbit IgG (H+L) (ab96899) at 1/500 dilution for 30 min at 22°C. Isotype control antibody (black line) was rabbit IgG (monoclonal) (0.1μg/1x106 cells) used under the same conditions. Unlabelled sample (blue line) was also used as a control. Acquisition of >5,000 events were collected using a 20mW Argon ion laser (488nm) and 525/30 bandpass filter. Publishing research using ab32077? Please let us know so that we can cite the reference in this datasheet.